A number of fungi are known to infest and damage apple trees. Harsh chemicals are available on the market to remove these pests, but can be hazardous to the environment when not properly absorbed by the soil. Instead, many gardeners use a lime sulfur spray that is both an effective combatant against a number of pests while remaining environmentally friendly. The name lime sulfur spray applies to various pest sprays that contain different types of sulfur. Two common chemical formulas used in lime sulfur sprays are calcium polysulphide and calcium sulphide. These types of sulfur can be toxic to plants such as the apple tree. To minimize this toxicity, manufacturers add lime or calcium to their sprays, which softens to impact of sulfur on the plants. Gardeners use the lime sulfur spray by applying the substance onto the tree, specifically the leaves. Focus is placed specifically on the leaves, where various pests may feed or propagate. Damage to a tree's leaves can halt its ability to properly develop and photosynthesize. The frequency of each spray and the amount of sulfur used is determined based on the type of fungi present. Lime sulfur is specifically intended to control and reduce the spread of fungi such as apple scab, black knot and black spot. 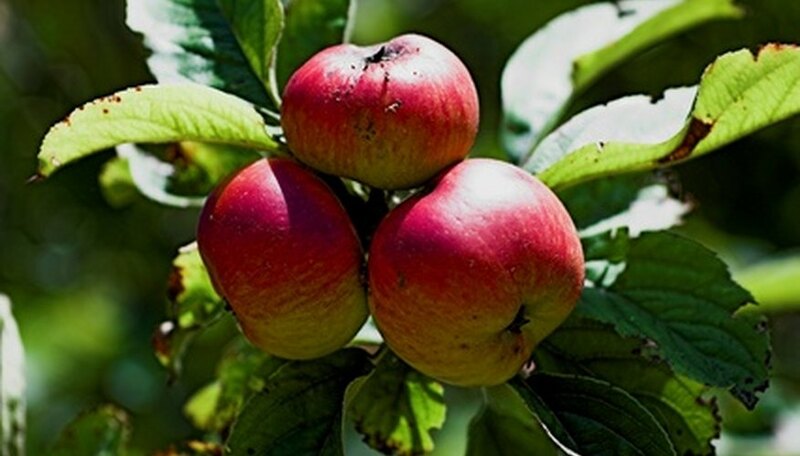 These fungi are dangerous to apple trees and if left untreated can result in stunted growth, lack of fruit production and even the death of the plant. An indirect consequence of using lime sulfur spray is a reduction in other pests including mites. Although lime sulfur spray is effective against these pests, many infestations will require an insecticide to cure the tree. Lime sulfur spray is only able to fight against fungi that are already present on the tree. It is unable to prevent spores from developing into fungi before they attach themselves to the plant. This is a huge downfall for gardeners thinking of switching from chemical-based fungicides to lime sulfur. Also, dormant oil, which is often used by gardeners to treat insect problems infesting apple trees, becomes toxic to the plant if mixed with lime sulfur spray. Gardeners must wait at least four days before applying oil once the tree is sprayed to avoid harming the tree. Lime sulfur works by stopping the reproduction of the fungi. These dangerous fungi attempt to take root in plants and trees. Hindering their growth and stopping the germination of fungi spores eventually frees the tree from the threat.